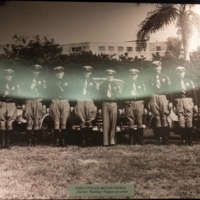 The Orlando Police Department (OPD) motor patrol in 1948, with Lieutenant Vernon "Bulldog" Rogers in the center. The OPD was established in 1875, the same year Orlando became incorporated into a city with only 22 votes. The motor patrol was first created during the 1930s with the purchase of four patrol cars and a motorcycle in 1934. Lt. Rodgers was the first officer in the department to ride the OPD's 1200cc front-end Harley Davidson. Original black and white photograph, 1948: Orlando Remembered Exhibit, Orlando City Hall, Orlando, Florida. "Orange County Sheriff's Office Office of the Sheriff Historical Highlights." Orange County Sheriff's Office Office of the Sheriff Historical Highlights. Accessed February 3, 2016. http://www.ocso.com/officeofthesheriff/historicalhighlights/tabid/58/default.aspx. “Orlando Police Department Motor Patrol.” RICHES of Central Florida accessed April 22, 2019, https://richesmi.cah.ucf.edu/omeka/items/show/7868.